Pumps & Systems staff spoke with Doug Keith, Larges Drives Business Unit Lead, Siemens Process Industries & Drives Division, U.S., on the state of the industry entering 2018. What should end users know to be up to date on IoT/cyber security? If you did a SWOT analysis how would you describe the industry’s readiness to deal with this issue? Customer needs are becoming more and more complex. Machines, and the applications the machines power, require more sophistication as the digital age of processing industries continues to evolve. New data-capable and networked machines are providing more operational insight, allowing operators to manage assets and adjust parameters for greater levels of productivity. This connectivity provides the information backbone for the integration of man with machines, systems, processes and plants. And these more highly-complex machines create the compelling case for securing the operator’s infrastructure. 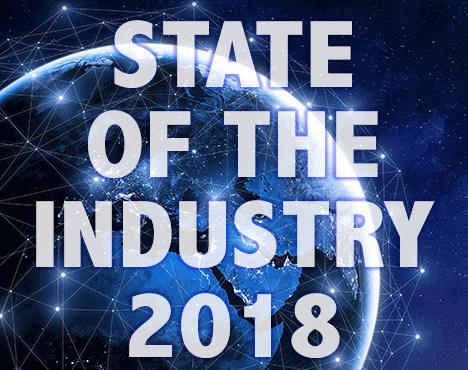 See more of our State of the Industry 2018 coverage. For example, a single oil pipeline may have dozens of highly-automated pumping station, and that pipeline creates a constant flow of not only oil, but data coming from this midstream operation. To maximize productivity, all of the pumping stations must be interconnected. With that data, you can prevent downtime. With that data, you can predict downtime. With that data, you can get back to producing quickly when there is a problem. Failure to embrace digitalization now could make the task of integration much more daunting in the future. But, the burden doesn’t fall only on the end user; OEMs, integrators and solution partners must work together with the end users on this digital journey. At Siemens, we will continue to be a trusted partner for our customers with a solutions-based approach and with domain expertise in key vertical markets and applications. Are changes in the workforce affecting your company? What are you doing to try to mitigate issues related to the skills gap? What are you doing to attract millennials and younger workers to the field/your company? We see a couple trends as it relates to our aging manufacturing workforce. We see some workers staying in the workforce longer than in previous years, this requires adjustments in training requirements to ensure new technologies are being used effectively. And as these older generations retire out of the workforce, we face a huge skills gap, with an estimated 2.7 million jobs likely to be needed as a result of retirements in the existing workforce. To help mitigate the skills gap, we are investing in STEM and encouraging high school students to focus on technical options. A specific example in a county where one of our plants is located, we worked with the local high schools to create a manufacturing track for high school students; this curriculum demonstrates to the students about some opportunities in the technical field and how technology has evolved. Today’s factories require significant mechatronic, automation and programming. We are also working in our communities to install manufacturing apprenticeship programs to teach operations skills. Hopefully industry can attract more millennials and manufacturing continues the journey toward digitalization. How can pump professional help with infrastructure issues? What aspects of infrastructure in the U.S need the most attending? Total Cost of Ownership, or TCO, may be one of the most under-considered aspects during capital-investment planning. Every processing industry company must be competitive and most must be globally competitive; therefore investments in infrastructure and processing assets should be analyzed and measured in years of efficiency and uptime, years of meantime between failure and meantime to repair and years of productivity. Just understanding that the first cost for an investment of a new motor usually only represents 1-2 percent of the total cost of ownership of that motor during its 30 year lifespan, should drive companies to analyze investments differently upfront. This is why motor performance and precisely controlling that motor is so important, and this is why data is so important to provide the ability to lower TCO through preventative and predictive maintenance and analytics. What should we expect from the oil and gas industry in 2018? In 2017, we saw consolidation in the market, and now we believe there could be increases in investments in the O&G industry in 2018. Even in a flat market, companies must do standard maintenance, improve reliability and improve operations even to maintain current levels of productivity. When investments inch up, above and beyond traditional MRO requirements, then we could see some positive movement in the industry because more expansion projects may be emerging. At Siemens, we will continue to innovate – focusing on motor and drive improvements that deliver higher electrical efficiency and increase power output from an even smaller equipment footprint. Siemens is investing in delivering significant gains in drive train analytics to customers, collecting the right data from motors and drives, analyzing this data in real-time and realizing reduced downtime.